You shouldn't ever pay full prize for an electric razor. That's for mugs. It's for the birds! As the Americans say. Always shop around for the best deal. Or, in this case, on this breezy Cyber Monday afternoon, take our advice and head straight for Amazon, where the best electric razor a man can get (or a woman can get, to give to a man as a Christmas present), can be had with a huge discount. 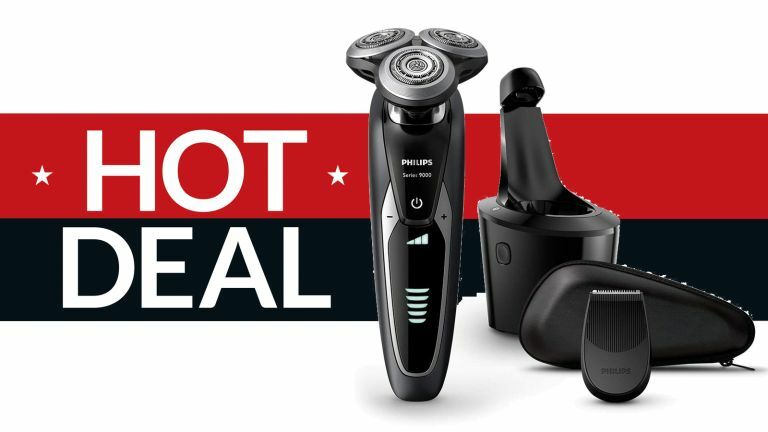 The best shaver you can get, other than Philips' own upgraded Series 9000 Prestige, the Series 9000 is streets ahead of previous top-end Philips shavers, and even bests Braun's excellent Series 9. Its rotary motion removes up to 3 days of stubble growth with minimal irritation and fuss, thanks to V-Track blade system PRO, mounted on 8-direction ContourDetect heads. Fully waterproof, it can be used in the shower, or with shaving foam. It's also supremely easy to clean. And if you like your shaver not just clean but fully sterilised after every use, reach for the SmartClean Plus system included with this model. There is an alternative option here, which is to head over to Philips online store. There you'll find all manner of bargains including the Series 9000 with SmartClean Plus. Ironically, Philips can't actually quite match Amazon's price, but it is close, and the model they have on sale is a more fetching steel blue colour, rather than boring old black.